School web design is difficult to get right. Some argue that the design should be orientated around looking child friendly with lots of clip art, and pastel colours. While that approach does work for some, we would always advise a clean and adult friendly website design since it is the parents who will use it, and it is your chance to impress a parent with how good the school is. We developed the new Gainsborough school web design with the parent in mind and worked closely with the school to make sure that the website not only represented them well, but also provided clear information for parents and Ofsted. This website is completely bespoke, implementing custom fields and plugins to make it easy to manage and update. Having worked closely with schools in the past we know that while having a CMS is great – it also needs to be very user friendly so that it can be managed in house by admin staff and teachers. With that in mind we created template areas for galleries, automatic news feeds and blog feeds that populate other area on the website, and made the management of each section very easy to use. We developed the site to make sure that the layouts will be neat and uniform throughout the site regardless of the skill level on the content management system. Our aim was to not only hand over a site that looks good, but one that will continue to look good and perform well for years to come. 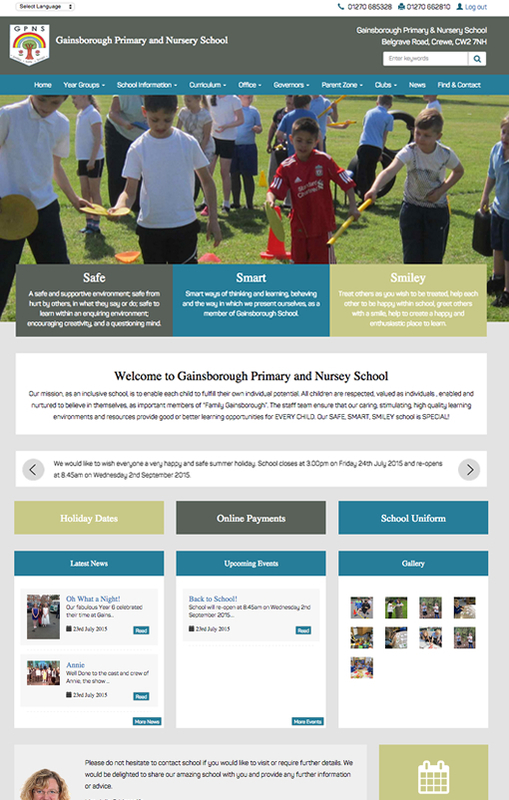 An image says a thousand words, and with this school web design we were very lucky that Gainsborough had so many brilliant images of the children and the school. It made designing the pages and galleries so much easier and works well to show the ethos of the school. Some of the main features of this school web design includes: bespoke galleries of teachers and students, news feeds, calendar management, event management and a Google translator for foreign parents.